Mid-Missourians enjoy an abundance of options when it comes to eating and drinking. From fast food to four-star, there is something to satisfy nearly any taste. For those who desire a meal with a little something extra, several local establishments have added services that aim to elevate the traditional dining experience. Whether you are celebrating a special occasion or just want to try something different, here are some extraordinary ideas to consider. Bottle service is a luxury usually associated with big city nightclubs, but Room 38 brings this VIP amenity to Columbia. Guests can forgo the long wait at the bar by requesting bottles of their favorite spirit — along with mixers, fruit, cocktail glasses and ice — be delivered to them. Patrons can make their own drinks or have a server prepare their beverages tableside. For more privacy, reserve the VIP Room, which comes with a dedicated waitstaff. The chef will customize an appetizer buffet for your group, or you can order off the menu. The room, which can accommodate as many as 30 people, provides a glamorous and intimate atmosphere with candles, cocktail and lounge tables, and booths upholstered in plush red velvet. A seat at the chef’s table at this downtown Thai restaurant will literally take your dining experience to the next level. The table, which must be reserved at least a week in advance, is located on the mezzanine balcony to give guests both privacy and a bird’s-eye view of the action. From Monday to Thursday, Bangkok Gardens’ executive chef and owner, John Pham, will prepare and host a specialized gourmet dinner for groups of two to 15. 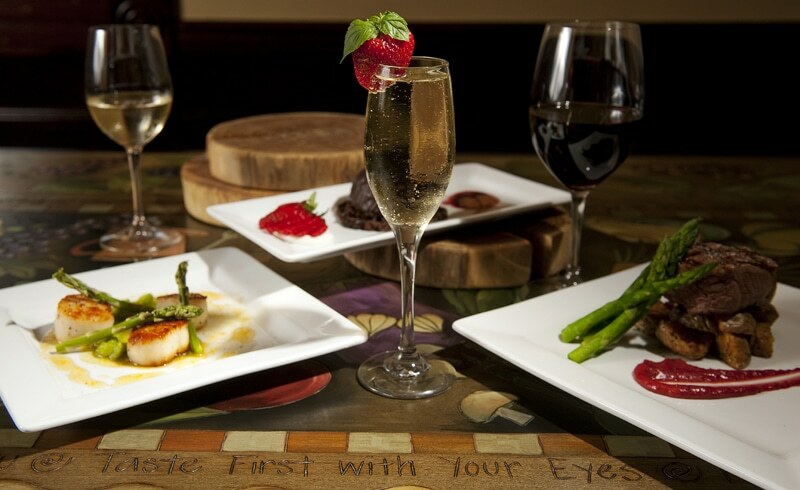 The meal includes a signature cocktail, appetizer, entrée and dessert paired with top-shelf wines or liquors. Pham says he offers his chef’s table diners personal attention and unique culinary delights that aren’t available on the regular menu. Centerpieces and other table decorations may be requested to complement the meal. An upscale and sophisticated meal is what diners expect at Bleu Restaurant & Wine Bar, and the chef’s table doesn’t disappoint. The executive chef, bar manager and pastry chef work together to come up with a one-of-a-kind menu in three, four or five courses. Patrons can request certain foods or allow the chef to create a surprise tasting. Each course is presented by the chef who walks diners through their meal and answers any questions about the preparation. Aside from the meal, the table itself adds a special touch to the evening. The wood structure was custom-made for Bleu and features colorful, hand-carved images of fruits, vegetables, wine, seafood and desserts. The table’s border is etched with phrases such as “Taste First With Your Eyes,” “Eat Fine Food” and “Drink Good Wine.” Separated from the main dining room, the chef’s table offers an exclusive setting for a first-class evening. You don’t have to be in the company of the queen to experience the elegance of a traditional English tea. At Victorian Country Inn, you can reserve a private high afternoon tea or a tea luncheon in the Victorian Tea Parlour. The high afternoon tea comes with a choice of loose-leaf teas or coffee, gourmet pastries and mini tea sandwiches arranged on a three-tiered stand. Innkeeper Barb Spencer, also known as “Ms. Bee,” will provide a lesson on the history of tea and the language of fans. For a heartier meal, the tea luncheon comes with loose-leaf tea or coffee, herbal fruit iced tea, chef’s choice of soup or salad, a light entrée such as quiche, tea sandwiches or chicken salad, and dessert. Everything is stylishly presented with fine china, white linens and sterling silver service. Guests are encouraged to dress in garden party attire for a stately and fun afternoon. Liz Huff, executive chef and owner of Catalpa, promises a relaxed, interesting and fun time when her guests sit at the chef’s table in her restaurant. The special seating area is a copper table for six located in the kitchen. Diners get a behind-the-scenes look at how Huff and her team prepare meals and may ask questions as she cooks. Huff says she keeps things casual by telling jokes and even asking customers to deliver orders from the kitchen to the dining room. Groups at the chef’s table can order from the regular menu or try the surprise tasting menu, which includes appetizer, entrée, dessert and drinks. Huff also teaches private cooking classes on days when the restaurant would normally be closed. She uses her own original recipes to tailor each class to the interests of the participants. At the end of the course, Huff hosts a dinner party for her students at Catalpa and serves the dishes they created that day.